Macau (or, "the Las Vegas of the East", as it's sometimes called) is an unusual and fun destination for gamblers looking for something more exotic than Las Vegas or Atlantic City. It provides a very different experience to those locations, and is well worth a visit if you have the opportunity. Travelling to a destination such as Macau is probably going to cost you a significant sum of money, so you'll want to make the most of your trip. That's exactly why we've put together this guide. We've provided some basic information about Macau, including the entry requirements, along with details on all the gambling available. We've also written about some of the casino venues and a few of the other things there are to do and see. Macau is a peninsula off the southern coast of China, not far from Hong Kong. It was part of Portugal until 1999. Since China's re-acquisition of Macau, tourism has tripled from 7 million annual tourists to almost 22 million tourists. Macau is happy to have visitors from English-speaking countries like the United States, Canada, Australia, and New Zealand. All you need is a passport. Most of you are probably going to Macau to gamble, so its unlikely youd be interested in staying for more than 30 days. But if you are planning to stay that long, youll need to apply for a visa. If youre from the UK or Ireland, you can stay up to 90 days without a visa. Much of the increase in the tourist industry is the direct result of gambling deregulation in 2002. Even though it's called the Vegas of the East, it's still a relatively small and quaint gambling destination—at least compared to Las Vegas. Consider the number of hotel rooms available in each destination. Las Vegas boasts of over 148,000 hotel rooms in the city; Macau only has 19,600. But even though the destination has only around 15% of the hotel space available, their gambling revenues are twice as much as Las Vegas each year. The mix of cultures provides a unique experience in gambling travel. The food and architecture differ from what you'll find anywhere else in the world. One might expect it to be similar to Hong Kong, since the two destinations are so near each other, but that's not the case at all. In fact, you'll probably see two different sides of Macau. After all, twenty years ago, it resembled nothing more than a sleepy little village with a few beaches. Some of that atmosphere remains, but alongside that is the hustle and bustle of new development spurred by the massive interest in gambling and tourist accommodations. Macau offers more than just gambling. It's also a well-known destination for shoppers—in that respect, it IS much like Vegas and Atlantic City. The sight-seeing in Macau is of an entirely different nature. It's also an affordable vacation, assuming you can keep your gambling under control. If you're used to visiting casinos in the United States, you'll know that everyone does business in US dollars. In Macau though, you have to make adjustments for the local currency. Patacas are the local currency. They're analogous to a dollar, as they're made up of 100 avos, the Macau analogue to a penny. Like most countries, the money in Macau comes in the form of coins and banknotes, although lower denominations of patacas are coins rather than notes. Where in the United States we have $1 and $5 bills, in Macau, you would use a coin for 1, 2, or 5 patacas. They have banknotes starting at 10 patacas and going up to 1000 patacas. The local abbreviation for patacas is MOP$. Hong Kong dollars are worth slightly (about 3%) less than patacas, but the hotels, casinos, restaurants, and shops in Macau ignore that 3% and just treat Hong Kong dollars as having equal value to patacas. If you're planning to spend part of your trip in Hong Kong, you might as well get all your foreign currency in Hong Kong dollars. Patacas are not accepted in Hong Kong, but Hong Kong dollars are accepted in Macau. If you're planning to spend your entire time in Macau, you can use either form of currency. The abbreviation for Hong Kong dollar is HK$. Hotels generally list their rates in HK$, while most other places tend to use MOP$. If you're going to Macau, the chances are you're planning to do some gambling. Asian cultures, China especially, love gambling. As a result, much of the traffic in Macau casinos hails from Taiwan and Hong Kong. Casino games are far and away the most popular form of gambling, with poker some way behind. You'll have over 30 different casinos to choose from, but probably about half of them are owned by foreign investors. So even though some of the sights and sounds of Macau are going to seem exotic, many of the casinos will seem strangely familiar. Like Las Vegas, you can find luxury casinos or more low-rent gambling halls, but all of them have unusual rules for gamblers from the West. We'll list some of the most notable casinos later, and also explain all about the games available. Texas Holdem is available at some casinos in Macau, but not all of them. The action is loose and aggressive, with most players staying in for the flop on almost every hand. This changes the texture of the game dramatically. If you can adjust to this difference, you can probably profit from the holdem action in Macau. Check the dress code of any casino you want to visit; you may have to dress formally. As we've already mentioned, there are over 30 casinos in Macau. The following are some of most notable ones. is one of the largest casinos in the world, with 546,000 square feet of floor space and over 3,400 slot machines. They also feature over 800 table games. is another must-see, with over 1,000 hungry tigers and over 370 table games. is similar in size to City of Dreams. is a popular casino, but it's also a legitimate tourist attraction because of the "dancing fountains" in the casino's Performance Lake. is notable for being the first casino in Macau to offer Texas hold'em. Please note that you're not allowed to take photographs in Macau casinos. This is a common enough rule in casinos even in the United States, although it's not as rigorously enforced in many destinations. Most of the traditional casino games you're used to in Las Vegas and Atlantic City are available here, including baccarat, blackjack, roulette, and hungry tigers—or, as we call them, slot machines. Fan tan and sic bo are also more popular there than they are here. Here is some information you should know about some of the more commonly played games. The blackjack games in Macau are some of the best in the world. If you use perfect basic strategy, you'll face (at most casinos) a house edge of only 0.16%. This makes blackjack in Macau one of the best casino games in the world. In fact, unless the MGM has changed its rules, you can play against a tiny house edge of 0.09% there. Some casinos offer more favorable rules than others. For example, the MGM and the Wynn allow players to re-split aces, which give the player an additional 0.08%. Most casinos uses six decks, but you can find casinos which only use five decks. This only adds 0.01% to the players' expectation, but every hundredth of a percentage counts. Some casinos offer less favorable rules, too. For example, the Galaxy casinos only allow the player to split up to three hands. Baccarat is the most popular gambling game in Macau casinos. It's played by the same rules you'll see in other casino destinations. Over half of the table games in a Macau casino are devoted to baccarat, and almost 90% of the casino's revenue comes from the game. Compare baccarat's popularity to the popularity of slot machines in the United States, which account for 60% to 70% of the casinos' revenue. That should give you an idea of just how popular baccarat is in Macau. 3 Card Baccarat is an unusual variation of the game, possibly unique to Macau. It uses one standard deck of playing cards. Face cards are 0 points, while all of the other cards are worth their ranking in points. The player and the dealer both get three cards. The best hand possible is three face cards. If no one has that hand, the hands are scored just like they would be in a traditional baccarat game. The player with the most points is the winner. In the event of a tie, the face cards act as tie breakers; the hand with more face cards wins. If the player and the dealer tie AND have the same number of face cards, then the hand is a push. You also have more bets to choose from in this version of the game. You can take the player bet, which wins if the player hand beats the dealer hand. This bet pays out at 1 to 1, but there is a 5% commission. The house edge on the player bet is 2.41%. The player wins 48.11% of the time. Obviously, the only dealer total bet worth making in 3 Card Baccarat is on a dealer total of 0, but even that has a higher house edge than a bet on the player. You can also bet that there will be a tie. This bet pays out 20 to 1, but a tie is less likely in this version of baccarat than usual--both the dealer and the player must not only have the same number of points, but also must have the same number of face cards in their hands. The house edge on this bet is atrocious at 20.8%. But believe it or not, that's not the worst bet in 3 Card Baccarat. That distinction belongs to the "Three Faces" bet. This one pays out at 16 to 1, but your chance of winning is only 1 in 100. This bet has the highest house edge of any casino game bet we've ever seen: 83.08%. Big Six is unusual in United States casinos nowadays, but it's still common in Macau. It looks a little different there, though. The house edge on this game is ridiculously high. On the orange, purple, and green bets, you face a house edge of 7.69%. Blue has a house edge of 15.38%. Yellow has a 19.23% house edge, and each logo has a house edge of 11.54%--you have to choose which logo you're betting on. Caribbean Stud Poker is more widely played in Macau than it is in Vegas. It's not going to replace baccarat there anytime soon, but it's still very popular. Game play varies little from the United States, although some of the payouts differ. You should check out the pay tables before you start playing, to make sure you know what to expect. Fan Tan is a casino game only available at the larger casinos. It's played on a large table with white buttons. The dealer also uses a cup and a wand as props. Almost sounds like a magic trick, doesn't it? The game starts with the dealer putting a bunch of buttons under a cup. The players then place bets on how many buttons are under the cup. The buttons are counted off into groups of four, and then the bets are paid off based on the numbers 1 through 4. The game pays out at true odds, but the casino takes a 5% commission. Multiple betting options are available, each of which has an exotic name. These are as follows. A Fan is the basic single number bet. It pays out at 3 to 1. The house edge on the Fan bet is 3.75%. A Nim bet is a bet on two numbers, but one of those numbers has to be considered a "push". The winning number pays 2 to 1. The house edge on this bet is 2.5%. A Kwok is a bet on two numbers, but with this bet, you don't have to choose a number as a push. This pays out at even odds, and the house edge is 2.5%. Nga Tan is a bet on three numbers. Again, you have to choose one as a push. This pays out at 1 to 2, and the house edge is 1.25%. The She-Sam-Hong is to the Nga Tan what the Kwok is to the Nim. (I never thought I'd ever write anything like that sentence in my life.) You bet on three numbers, but you don't have to choose one as a push. This pays out at 1 to 3, and the house edge is 1.25%. Don't forget that a 5% commission is taken out of your winnings. That's not reflected in the payouts above, although the house edges listed do. Pai Gow is harder to find in Macau than you would expect. We've seen at least one report online that indicated it was harder to find in most Macau casinos than it is in Las Vegas. The rules of etiquette for Macau Pai Gow are intense, too. It's played standing up around a table. Players get hands made up of what look like dominoes, which they then have to set. But the unusual thing about the game etiquette is that you're not allowed to look at your tiles. You have to feel the number of pips on each tile by using your fingers. Also, you have to pick up your tiles one at a time. Keno might or might not still be available in Macau. The most recent reference we could find to the game in Macau on the Internet was dated 2012, and it said that keno was only available in one casino, the Lisboa. It's played the same in Macau as it is in Las Vegas, with 80 balls, 20 of which are drawn at random in each game. Macau keno does offer an additional betting option – High/Low/Middle. With this you're basically betting on whether the balls will fall into one of those three categories. High: Majority of balls are between 41 and 80. Low: Majority of balls are between 1 and 40. Middle: 10 of the balls are high, and the other 10 balls are low. Sic Bo is a popular dice game in Macau casinos. It's rarer in casinos in the United States, although some casinos here have it. The standard version of the game is found there, but Macau also offers an unusual version of the game called Yee Hah Hi (Fish Shrimp Crab). It uses multi-colored pictures on the sides of the dice instead of pips. The symbols used include the fish, shrimp, goard, coin, crab, and rooster. The colors used include red, green, and blue. All of the usual Sic Bo bets are available at the Yee Hah Hi tables, but you'll also find three additional bets based on the colors. You can bet on whether or not all the dice come up the same color, two of the dice come up the same color, or if one of the dice comes up as the color you choose. Sic Bo can be a lot of fun, but the house edge is relatively high. The best bets on the table (small/big or odd/even) offer a house edge of 2.78%. Casino War is a simple game that most Americans are familiar with. In Macau, it's usually played with six decks. It features the same options and house edge as the American version of the game. Craps is available in Macau, but it's not popular. It's played almost exactly the same in Macau as in the United States. In fact, the dealers even call the game in English. Fortune Three Card Poker is just another name for Three Card Poker. It's more popular in the USA than Macau, but it's easy to find at most larger casinos there. Mah Jong Pai Gow isn't a common game anywhere-- not even in Macau--but you can still find it in some of the older casinos there. It's played with Mah Jong tiles. The dealer doesn't play, but she does take a 5% commission from all the winners. Mah Jong Pai gow is similar to baccarat. Players bet on the banker or the player. The house edge is 1.25% for the banker bet and 3.75% for the player bet. Roulette is readily available in most Macau casinos, and they only offer single zero roulette, which makes the game a better deal than it is at most U.S. casinos. The house edge on Macau roulette is 2.70%. Slot machines can be found in Macau casinos, but they're not popular there like they are in the United States. In fact, slot machine revenue in Macau casinos is less than 1% of their total gambling revenue. That represents a tremendous cultural difference. Slot machines in Macau are called, aptly enough, "hungry tigers". Their payout percentages are lower than you'd normally see in a Las Vegas or Atlantic City casino. You won't generally find very good pay tables for these games, either. 7/5 and 6/5 Jacks or Better are common. On the other hand, progressive jackpot games, including video poker, are more common in Macau than elsewhere. If you can find a video poker game with a high enough progressive jackpot, the payout percentage can go up significantly. Macau offers gamblers from the West an opportunity to see how culturally different gambling can be in other countries. It's hard to imagine a casino, or a city of casinos, which only sees less than 1% of its revenue from gaming machines. It's also hard to imagine the insane popularity of baccarat. It's worth the trip just to get a taste of this kind of gambling mayhem. There are plenty of places to stay in Macau, and we can help you choose the right one for you. We've listed a range of the best hotels in a variety of categories. 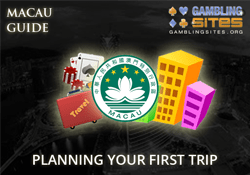 In this directory we have provided details on a number of Macau casinos. It includes information on the gaming and other facilities available at each venue. Macau is not just for gamblers, and there are some other things to do and see. We've detailed some of the best non-gambling activities on this page.